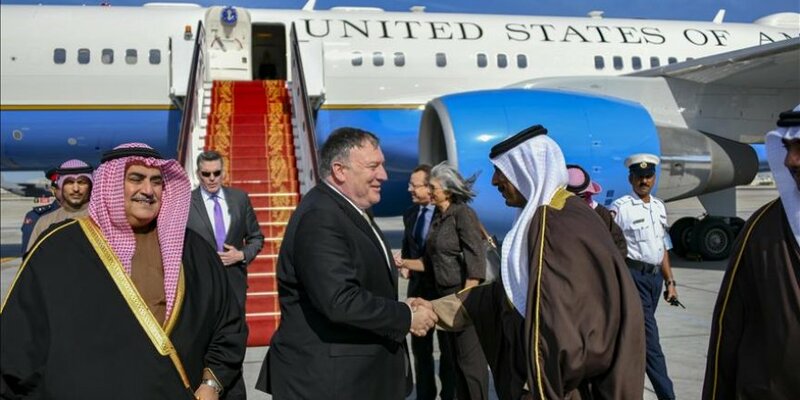 U.S. Secretary of State Mike Pompeo arrived in Bahrain on Friday for the fourth leg of a nine-nation tour of the Middle East. According to the U.S.-funded Al-Hurra television channel, Pompeo is expected to meet with Bahraini King Hamad bin Isa Al Khalifa, Crown Prince Salman bin Hamad, and Foreign Minister Sheikh Khalid bin Ahmed Al Khalifa. Al-Hurra quoted an unnamed State Department source as saying that Washington’s continued partnership with the Gulf States was “necessary” to protect global energy supplies and counter “Iranian aggression”. Pompeo kicked off his tour in Jordan on Tuesday, followed by an hours-long visit to Iraq, where he met Iraqi President Barham Saleh, Prime Minister Adil Abdul-Mahdi and Parliament Speaker Mohamed al-Halbousi. On Wednesday and Thursday, he was in Cairo, where he met Egyptian President Abdel Fattah al-Sisi and Foreign Minister Sameh Shoukri, along with other Egyptian officals. Some observers say Pompeo’s tour is intended to reassure Washington's regional allies in advance of a planned U.S. troop withdrawal from Syria. The tour will also bring Washington’s top diplomat to Saudi Arabia, Qatar, the United Arab Emirates, Oman and Kuwait.